Thank you so much Riddick for posting a great article! Re: What Are Democrats Running On? Free Sh*t and Slavery. Everyone "not in line" treated like Kavanaugh, "Guilty until Proven Innocent" , No money, they will have it all. The "Sheeple" are going to love it! Well, until they find out, that they are the main "Ingredient" in the "Brotherhoods" cookbook. MMmmm , very tasty! Nucking futz, is what it is today IMHO. The likes of "Mad Maxine" Waters, Diane "Dr. Evil" Feinstein, they've got it in for anyone who doesn't kowtow to their line of (group)thinking. To walk away, or not to walk away? 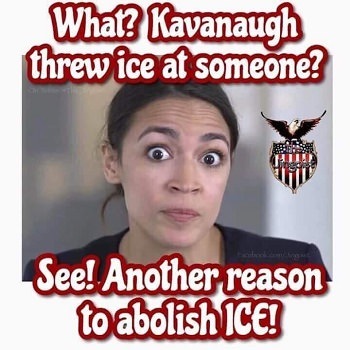 Hey, the Democrat party prefers folks stay... Sheep brains are tasty! Alexandria Ocasio-Cortez grabbing headlines, attention and cameras everywhere she goes isn't necessarily a good thing for the party she’s in. From the Green New Deal to Medicare for All, a number of incredibility unrealistic socialist proposals have been confidently discussed and championed by AOC and company. Just as a battle waged for years over the GOP's heart and soul prior to Trump putting an end to it – remaking the party in his own way – the same is true on the left today. 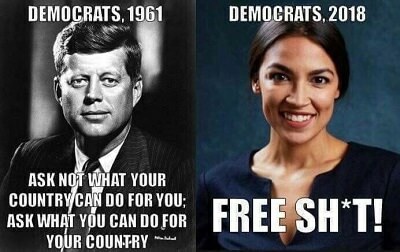 What a difference two months makes in AOC’s America! That’s a ten-point turnaround from two-months ago. You have to go back to May of 2016 to find the last time Republicans held this type of an advantage over Democrats in partisan identification. This is worth watching as we track into the 2020 cycle.